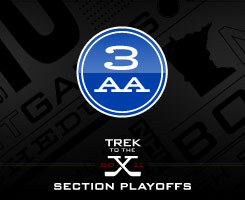 If this is how Section 3AA is going to play out, it will be one fun ride to the Xcel Energy Center. For the third time this season, Hastings and Woodbury went toe-to-toe, but this wasn’t for Suburban East Conference bragging rights. A tussle with No. 1 seed Eagan in the section semifinals was the prize. After splitting their two regular season games, No. 4-seeded Hastings beat No. 5 seed Woodbury 3-2 on Thursday, Feb. 24, in the Raiders' first playoff game at Hastings Civic Arena. Christian Turned pulled Woodbury within one with 1 minute, 29 seconds left in third, but it was not enough as Hastings advances to play Eagan on Saturday, Feb. 26 at the State Fairgrounds Coliseum in St. Paul. Nelson scored the game-winner with 7 minutes, 10 seconds left in the third period. He fired a low shot that was initially stopped by Woodbury goaltender Zach Moore, but the puck went straight up into the air. When it came down, the puck bounced in front, then over the goal line. That has how things have gone for Nelson against Woodbury this season. In the last meeting between the Raiders and Royals on Feb. 12, Nelson compiled a hat trick and two assists in an 8-3 win. He registered an assist earlier in the season, a 3-2 Royals victory on Dec. 27. Along with Nelson, teammate Nate Flynn was another consistent offensive threat for Hastings. Flynn’s speed and scoring touch added a level of excitement when the puck was on his stick in the Royals' zone. His power-play goal in the second, less than 2 minutes after Woodbury’s Matt Pederson opened the scoring, allowed the Raiders to regain control. Nelson and Flynn are leaders on the stats sheet and in the locker room. They wear captains badges on their jerseys. The power play clicked for Hastings against Woodbury in each of the last two games the teams met. Hastings was a perfect 2-for-2 on Feb. 24 and went 3-for-7 on Feb. 12 when it played the Royals. Hastings scored most of its goals on the power play in its previous meeting against the Royals by overloading its right side. The Raiders switched their strategy in the Thursday's meeting. Senior Night could not have ended any worse for Hastings on Feb. 17 against Stillwater. With the game appearing to have an overtime session, Kyle Mogren of the Ponies scored with .9 seconds left to have Raiders fans leave the Hastings Civic Arena with a bad 2-1 loss in their mouths. Whe Hastings received the No. 4 seed in Section 3AA, there was one more chance to send seniors out on a positive tune. "It was a tough way to end the regular season, especially on senior night," FLynn said. "but we were able to come back here and get a big win in our rink. It was just awesome." When rules stated that section playoff games had to be played a a neutral site, Hastings was one of the stronger teams, so it didn't matter. A rule change now allows certain sections to allow the highest seeded team to host the first round. This has not applied to the Raiders until this season, but barely over No. 5 seed Woodbury. "It's hard to believe that this was the first playoff hockey game in this arena," Welch said. "For years, it really didn't matter since we were always one of the top seeds. Lately, we haven't had the greatest of teams,so we have never hosted a playoff game and with the way Senior Night ended, winning a close game against a conference team is a nice way to go out." "The Stillwater game was kind of tough to lose," Nelson said. "Felt awesome being a senior in the last home game and pulling it out." With a packed arena, standing room only, the Hastings seniors went out in glory and more importantly, did not have their high school careers end in a place they have all grown to appreciate. "We love playing here and to get a playoff game here is even better," Nelson said. 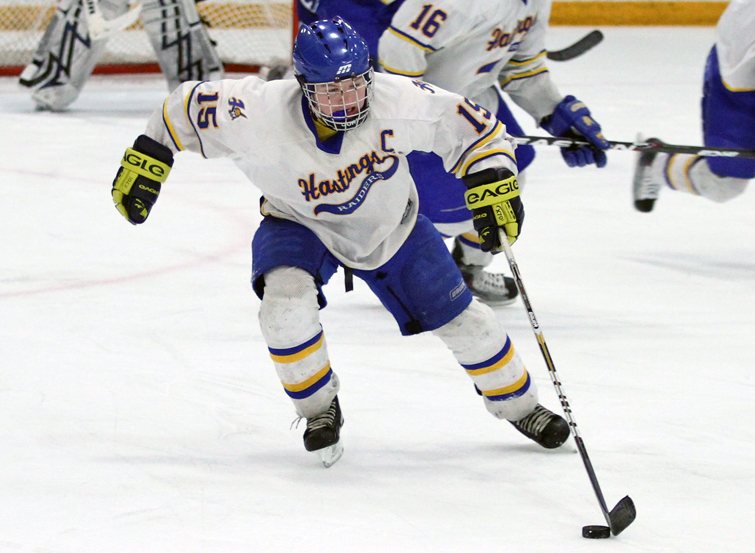 Austin Nelson scored the game-winning goal for Hastings as it beat Woodbury 3-2 in the first round of the Section 3AA playoffs on Thursday, Feb. 24, at the Hastings Civic Center. With Hastings leading 2-1, Nelson ripped a wrist shot that was first stopped by the right leg of Woodbury goalie Zack Moore. The puck fluttered in the air and innocently dropped behind the line to give the Raiders a 3-1 lead. With 1 minute, 29 seconds left in the third period, Woodbury's Christian Turner put away a rebound to cut the lead to one. Woodbury pulled Moore in favor of an extra skater and continued to attack Hastings in the closing seconds but could not get a clean shot on net as the Raiders collapsed the net to take away any scoring chances. Moore finished with 27 saves for the Royals and faced the bulk of the scoring chances compared to his counterpart at the other end, P.J. Piotrowski, who had 26 stops. Nelson had three goals and two assists in the Raiders' 8-3 victory in the Feb. 12 meeting between teams. He accounted for an assist in the first game, won 3-2 by Woodbury, back in Decemeber. Matt Pederson opened the scoring as Woodbury took a 1-0 lead. Hastings' Nate Flynn answered with a power play goal shortly after to tie the game at one. Zach Mellick gave Hastings a 2-1 lead late in the second period. The scored stayed that way until Nelson's goal in the third. Woodbury finishes the season with a 13-13-0 record. Hastings plays No. 1-seed Eagan. The Wildcats beat Park (Cottage Grove) 5-0 on Thursday. The Raiders and Wildcats play Saturday, Feb. 26 at 6 p.m. at the State Fairgrounds Coliseum in St. Paul. He seems to play his best against Woodbury. In what has now been three games against the Royals this season, Nelson has four goals and four assists when the Raiders have taken on their Suburban East Conference rivals. On Feb. 24, he scored what ended up being the game-winner, and assisted on the Raiders' second goal, which gave them a 2-1 lead. He was busy in the Royals' zone with physical play and constant offensive pressure. Flynn opened the scoring for the Raiders, as he tied the game in the second period. On top of that, Flynn was another constant force on offense for Hastings. He created chances on his own and set up others with great passes. Flynn's skating is something to be envious of. He is quick through the neutral zone and could help the Raiders be a bracket busting team in Section 3AA. In his final game in a Royals uniform, Moore stopped 27 of 30 shots. His positioning was solid and, on the game-winning goal by Austin Nelson, Moore was victimized by an odd bounce. If Moore was not solid between the pipes, especially early, this game could have been ugly considering Hastings' numerous scoring chances.